Turtle Rock Studios is plenty experienced when it comes to first-person shooters and delicately-balanced multiplayer. 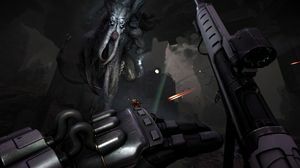 It comes as no surprise, then, that asymmetric multiplayer-only sci-fi shooter Evolve is looking great, writes James Cullinane. 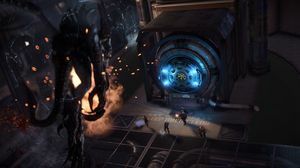 Evolve excites us for a number of reasons, and not the least because it's a new intellectual property (gasp!) bringing fresh thinking to the blunted multiplayer shooter scene – or at the very outside executing superbly on ripe thinking. Everyone in gaming has been talking about asymmetric multiplayer for a few years now but for whatever reason no one has truly delivered. 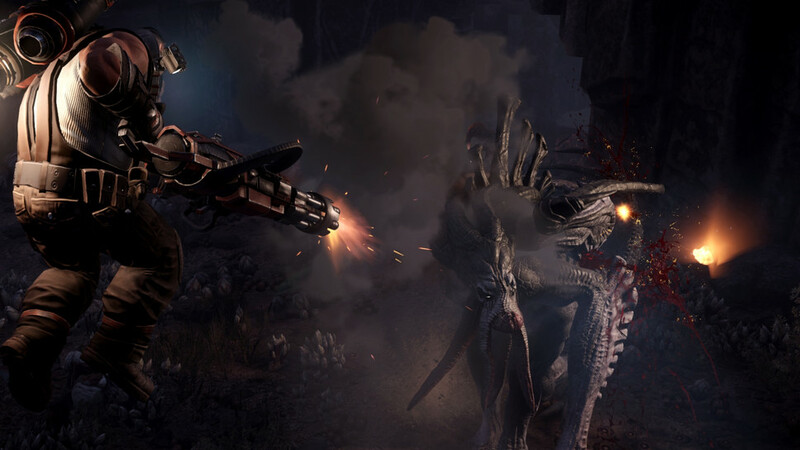 Evolve looks like it's it, the long-awaited killer app. The premise is simple: four player-controlled hunters set out to trap and kill one player-controlled monster, but as the game progresses and the monster evolves, the power dynamic shifts. Prey becomes predator. Achieving that shift so subtly is a marvel of gameplay balancing, and the result is water-cooler moments in every round. 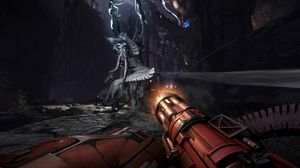 We played it yesterday over a LAN which, unsurprisingly, is the optimal way to experience Evolve. In February, we looked at the first four hunters and the Goliath monster, a brutish fire-breathing beast in the tradition of King Kong. 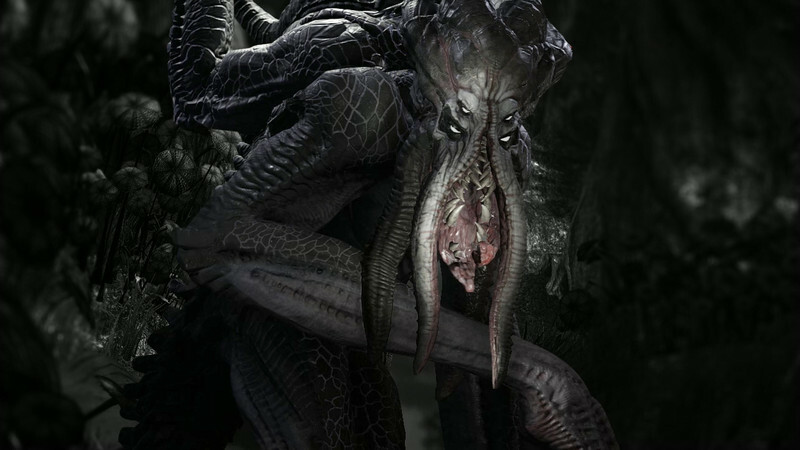 Yesterday, we played the Kraken, a monster clearly inspired by deep sea creatures, HP Lovecraft's Cthulu mythology, and at least one designer's repressed misgivings about female anatomy. With powerful lightning abilities, the Kraken is best played as a ranged, aerial caster. When caught on the ground by a well coordinated team of hunters, the Kraken is weak and quickly dispatched. This newer build also introduced four new hunters. Hyde is the new assault class. His flamethrower is the most powerful weapon in the game, but it's only effective at close range. He also has a personal shield, which provides him with temporary immunity. Hyde's singular role is to provide damage and plenty of it, but he's a high-risk high-reward character who must get perilously close to the monster to be at his most effective. Lazarus is the new medic, but he only has one area effect heal on a long cooldown. His real talent, as his name would suggest, is resurrecting dead hunters. That sounds underwhelming, but death in Evolve is a brutal sentence. Players are out of action for up to two minutes, which is more than enough time for a monster to clean up the remaining hunters, particularly late in each round when teamwork and coordination are imperative. Maggie is the new trapper, and it's her part to snare the monster before it can flee from the hunters, especially in the earliest parts of any round. Up against the Kraken, Maggie's harpoons are particularly useful as they tether the monster to the ground. Maggie comes with a beast companion, a trapjaw she's named Daisy. Daisy can track the monster, and once levelled a little, can even revive fallen comrades by licking them on the face. In the build we played, Daisy's sometimes-erratic behaviour suggests her AI still needs work. Speaking of AI, Bucket is the hunter dropship's artificial intelligence, given shape within a robot. Bucket is a support character whose head is entirely detachable, and players can fly it like a UAV to tag the monster and give the hunters a competitive edge. Of course, Bucket's torso and limbs remain put, meaning teams should hang back, in case the monster turns what's left into scrap. Map knowledge will be critical to success in the final game. The level we played was full of ravines and gorges, providing plenty of opportunities for both hunters and monster to set up ambushes or break line of sight. To evolve, the monster must kill and eat wildlife. Elite creatures also provide special boosts to particular statistics such as movement speed. The hunters are also able to kill elites and gain these benefits. 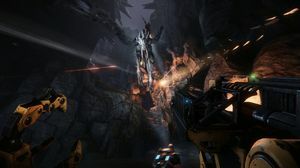 To that end, resource control and denial is likely to be an important part of the game as players become more familiar with Evolve's dynamics. It should come as no surprise that Evolve scooped massive critical acclaim at E3 this year. It should be on every gamer's radar, although we're unsurprised when we learn it hasn't been, as it really must be played to be understood. The game specialises in emergent moments and for that has great talkability. It's not that the concept of four-versus-one is difficult to convey in any way, it's how the game subtly shift gears throughout the round, how it captures that sense of desperation or empowerment as the monster becomes stronger, and in doing so, it brilliantly taps directly into one of our most instinctual dilemmas, fight or flight. In one hunter's famous last words: clever girl. Evolve comes to PC, Xbox One and PlayStation 4 on October 21. Update: Alpha now running on PS4.